> Homeschooling > Another School Year Begins! Exactly a week ago, my kids and I started another year of homeschooling. I was pretty excited about it, since they are one year older and ready for new, exciting materials. I do use the workplans with my son, although I make some changes to account for the specific materials we have and his own interests. My son is now almost 7 and is ready for level 2 (or second grade) work. My daughter will be 4 in December, and has really matured in many areas. Last year was almost entirely Practical Life work for her, and now she is ready for new challenges. I am committed to putting out less work, but more quality work, than I did before. I think fewer choices is encouraging them to do more repetition, which is so necessary for mastery. Way back in this post, I showed our homeschooling classroom which consisted basically of our entire living room. This past summer I rethought that idea, and ended up creating a classroom in our family room instead. We bought a new couch, and the living room is now a living room again. I am very excited to do some presentations with both of them together. For instance, this Wednesday we hope to visit the Shedd Aquarium and so we’re doing Parts of a Fish together. We hit a little snag when one of our goldfish was found dead in the tank this morning, but those things happen, right? Anyway, the plan is for my son to do Parts of a Fish elementary-style, with pictures, labels, and definitions, and my daughter to do it preschool-style, with pictures, labels, and control cards of picture with label. I like the idea of presenting the work to them together, to foster the “community” feeling, and then letting them each do it at their own level. I decided to make “continent boxes” for each continent (filled with pictures, objects, animals, stamps, and coins), and have had a lot of fun putting them together. I was able to find boxes (the kind you store photos in) for all the colors of the continents – except yellow for Asia! I’ll keep my eye out for that one. I spent an afternoon dividing up all my continent objects, pictures, and books to go in each box. We’re going to start with Africa – not for any other reason than that I love Africa and I think it will be exciting to study. I like the idea of studying 2-3 continents really thoroughly every year in elementary so that by the end of the 3-year cycle, we’ve studied them all. As usual, eBay has been a great place to buy postcards, money, books, and artifacts from the different continents. My daughter loves math work like the bead stair and cards & counters. Yes, she did those things last year too, but now she is able to do them herself. Also her concentration, which would often wane by the time she reached “6” or “7”, has increased greatly and now she flies up to “10” with no problem. I really like seeing those tangible markers of growth in my kids. Sequence cards and sandpaper letters & numbers are also favorites. We’re going to continue reading tons of books (because you can never have too many of those!) as well as going on lots of field trips. I really like preparing for a field trip by studying the subject matter beforehand; for instance, we also read a book about the oceans today and will do an ocean animal matching work before our aquarium trip. I feel like the kids get more out of it that way. I’d love to hear about what all of you are doing, whether in the classroom or at home. 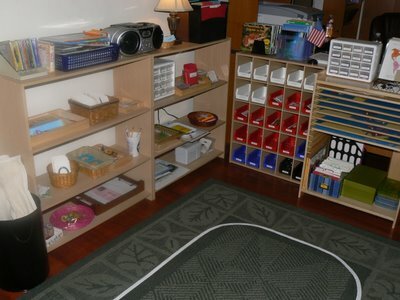 Any new great ideas for materials or organization? Recommended books or CDs? Classroom management tips? Please share! Also, while many of you have already started school, some may not have, so please check out the helpful suggestions for starting the school year successfully if you haven’t already. Many of the ideas are applicable to the first month of school, so take a look!